Adult cardiac disease is the most frequent cause of mortality in the western world where death, as a result of heart failure, is more prevalent than all cancers combined (1). Heart failure can be defined as a deficiency in the ability of the heart to pump an adequate supply of blood around the body. The initial stimulus for progression along this pathway can be wide-ranging; congenital malformations; myocardial infarction, hypertension, myocarditis, diabetic cardiomyopathy, ischaemia associated with coronary artery disease, familial hypertrophic and dilated cardiomyopathies (2, 3, 4). Following the stimulus, there is normally a phase of cardiac hypertrophy whereby individual cardiac myocytes increase in size as a means of compensating for damaged heart tissue in order to increase cardiac pump function. In the long term however, such cardiac hypertrophy can predispose towards heart failure (4, 5, 6). Developmental - Growth of the heart during embryogenesis occurs primarily through proliferation of cardiac myocytes. 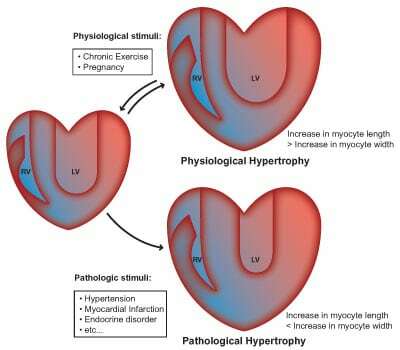 However, soon after birth, cardiac myocytes withdraw irreversibly from the cell cycle and subsequent growth of the heart occurs predominantly through hypertrophy rather than myocyte hyperplasia. Physiological - Occurs in response to exercise and pregnancy. Pathological - Occurs in response to abnormal stress. The growth seen with developmental and physiological hypertrophy is morphologically distinguishable from that seen in pathological hypertrophy. Whereas in developmental and physiological hypertrophy, the growth of the cardiac myocytes and hence the ventricular wall and septum is comparable with an increase in chamber dimension, in pathological hypertrophy, the ventricular wall and septum thicken but with a concomitant decrease in ventricular chamber dimension. Pathological hypertrophy frequently progresses to dilated cardiomyopathy, which may be due, at least in part, to activation of apoptotic pathways (7). In recent years, the identification and characterization of the molecular pathways leading to cardiac hypertrophy has highlighted a number of potential therapeutic targets. The prospective commercial market for novel drugs to treat cardiac hypertrophy is huge. Cardiac hypertrophy is associated with increased expression of cardiac myocytes contractile molecules, regulated at both the transcriptional and translational level. Key players, with enhanced promoter and/or protein expression include β-myosin heavy chain (β-MHC), and other modulators such as atrial natriuretic protein (ANP), B-type natriuretic protein (BNP), and the α-skeletal muscle isoform of actin (αSA) (8, 9, 10). Alterations in these key control proteins (ANP, BNP) and cytoskeletal proteins (β/α-MHC, αSA) increase the load and subsequent pumping potential of the heart. However, a net increased intracellular viscosity limits the efficiency of this effort leading to cardiac myocyte hypertrophy (11, 12). Hypertrophic growth involves control of cardiomyocyte gene expression at multiple molecular levels. Master regulators of gene expression in cardiac myocytes such as myoD, MEF2, and members of the GATA family (13, 14, 15), use histone acetyltransferases (HATs) and histone deacetylases (HDACs) to remodel chromatin as part of the mechanism by which they control gene expression (16, 17, 18). Recent work from our group and others has demonstrated that acetylation of histones alters gene expression in cardiac cells and response to pharmacologically induced-hypertrophy and simulated-ischaemia and reperfusion (7, 17, 19). Acetylation of histones is thought to lead to alterations in gene expression by relaxing chromatin (i.e., the packaging of DNA) and is catalysed by HATs. By contrast, HDACs mediate the removal of acetyl-groups. HDACs have been shown to be important endpoint targets of cell-signaling pathways involved in the induction of altered gene expression in cardiac hypertrophy and ischaemia/reperfusion injury (20) and are undergoing intense investigation as possible therapeutic regulators of hypertrophy-associated cardiac disease. There are more than a dozen individual HDAC enzymes which can be divided into three main classes - class I HDACs (HDACs 1, 2, 3, and 8), class II HDACs (HDACs 4, 5, 6, 7, 9, and 10) and class III SirT 1-X. Class III are distinguished from class I and II as they are NADH dependent enzymes (21). Class I and II HDACs play key opposing roles in modulating cardiac hypertrophy in CHD. Class II HDACs are thought to repress whereas Class I HDACs induce pro-hypertrophic genes. A novel molecular therapy would aim to target and inhibit Class I HDACs thereby regulating cardiac hypertrophy. 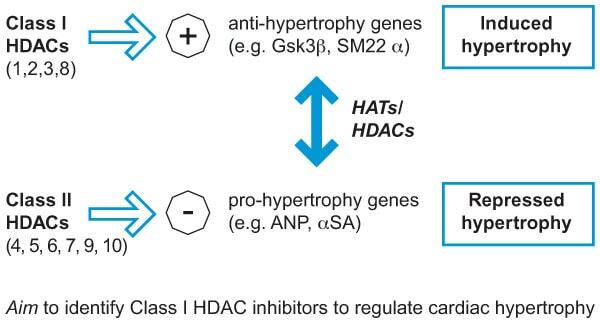 The demonstration of separate classes of HDACs which can regulate pro- and anti-hypertrophy genes underpins the use of class selective inhibitors of HDACs (especially those that target class I enzymes). The clinical use of HDAC inhibitors would allow the control of key hypertrophic genes, and would provide a novel molecular and therapeutic approach. HDAC inhibitors have progressed well as experimental therapeutic agents for the treatment of cancer, but most of these agents are non-selective. By contrast, the bicyclic tetrapeptide HDAC inhibitors FK228 and Spiruchostatin A appear to possess selectivity towards class I HDACs (28 and unpublished data). This activity profile may make them particularly attractive as starting points to develop novel therapies for cardiovascular disease. Indeed, it has already been shown that Spiruchostatin A is a highly potent inhibitor (~pM) of HDACs in cardiac myocytes and effectively interferes with the pro-hypertrophic effects of phenylephrine and urocortin (17). Dissection and characterization of the signaling pathways leading to cardiac hypertrophy has led to a wealth of knowledge about this condition both physiological and pathological (29) . Although these pathways have still to be defined further and there will undoubtedly be future pathways and players to be discovered; the challenge currently will be to translate this scientific knowledge and understanding into potential pharmacological therapies for the treatment of pathological cardiac hypertrophy. 1. Scarabelli, T.M., Knight, R., Stephanou, A., Townsend, P.A., Chen-Scarabelli, C., Lawrence, K., Gottlieb, R., Latchman, D., and Narula, J. Clinical implications of apoptosis in ischemic myocardium. Current Problems in Cardiology, 31, 181-264, 2006. 2. Klein L, O'Connor CM, Gattis WA, Zampino M, de Luca L, Vitarelli A, Fedele F, and Gheorghiade M. Pharmacologic therapy for patients with chronic heart failure and reduced systolic function: review of trials and practical considerations. 7. Davidson, S.M., Townsend, P.A., Stephanou, A., Packham, G., and Latchman, D.S. Inhibitors of p300 HAT activity or HDACs can dissociate the hypertrophic and protective pathways in cardiac myocytes: divergent effects of urocortin and phenylephrine. ChemBioChem, 2005, 6:162-170. 17. Davis FJ, Pillai JB, Gupta M, and Gupta MP. Concurrent opposite effects of an inhibitor of histone deacetylases, Trichostatin-A, on the expression of α-myosin heavy chain and cardiac tubulins: Implications for gain in cardiac muscle contractility. American J. of Physiology (Heart and Circulation Physiology) In Press.